December 4, 2018 – Consumer Guide® Automotive, the leading publisher of authoritative, unbiased new and used-car reviews for 52 years, today announced the recipients of its 2019 Best Buy Awards. A Consumer Guide Best Buy represents the finest balance of attributes and value in its class. For 2019, 43 Best Buys have been awarded in 22 classes, providing clear, easy choices for consumers. 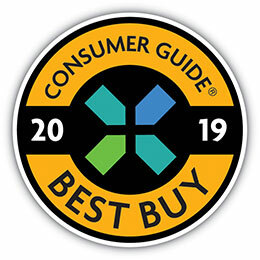 The complete list of Consumer Guide Automotive 2019 Best Buy Awards can be viewed at http://consumerguide.com/best-buys. And watch for the Consumer Guide® Automotive 2019 Car & Truck Best Buys magazine on newsstands nationwide December 1, 2018. Consumer Guide’s editorial team drives more than 100,000 miles every year evaluating what these vehicles do well–and what they don’t. Whether it is driving through the city, on highways, in rural areas, on long trips, or simply picking up the kids at school, these vehicles are tested in the same way that typical car buyers would use their vehicles. Complete reviews of the winning vehicles, as well as other pertinent information for in-market car buyers, can be found at http://consumerguide.com. For a daily dose of automotive news, test-drive reviews, humor, and history, visit the CG Daily Drive blog at http://blog.consumerguide.com/.